The more you wash, the more you wax! Wolfgang Uber Wash & Wax redefines efficiency by combining exceptional cleaning abilities with German Super-Polymers for protection. Wolfgang Uber Wash & Wax encapsulates dirt and road grime to safely remove it from the surface then leaves a layer of protection behind to help keep that contamination from coming back! Already have paint protection? Perfect! Wolfgang Uber Wash & Wax is the ideal product for weekly maintenance washing. Wolfgang Uber Wash & Wax adds additional protection giving your LSP a boost every time you use it! While detailing is an enjoyable task and can be therapeutic at times, you still want to ensure the method you use to wash your vehicle is efficient. Let�s face it; time is valuable, and you want to get the most of every moment. Wolfgang Uber Wash & Wax caters to those needs by combining the two most crucial steps of vehicle maintenance in just one bottle. 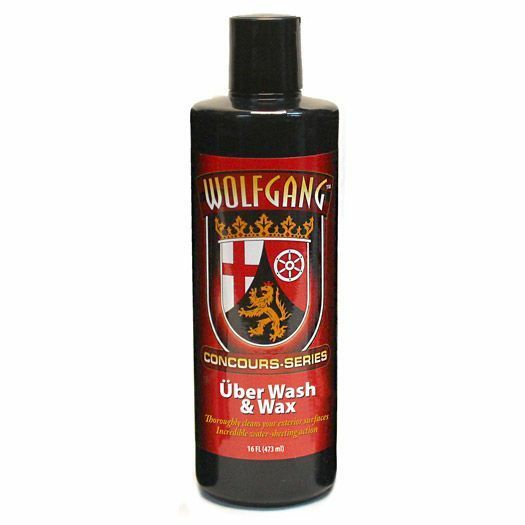 Packed with powerful cleaning properties and boasting German Super-Polymer protection, Wolfgang Uber Wash & Wax will revamp how you clean your car! When it comes to maintaining your vehicle�s protection it can become quite perplexing. More steps, more products, and more of your time that could be spent enjoying the open road! So, the real question is, why wouldn�t you want to make it easier? Every time you wash your car with Wolfgang Uber Wash & Wax the infused polymers add to your existing protection - continually boosting your protection while adding its own superior water sheeting abilities. The added protection of Wolfgang Uber Wash & Wax will only improve on the ability to repel dirt, grime, and other contamination that isn�t welcome on your car�s surface! Great suds and foam. Does a good job of removing road grime and bird droppings if you massage them a bit. ProsReally gives car a wet look - still looks great 5 days after. Dust does not seem to adhere as much now. ConsA bit pricey especially because directions call for you to use what seems to be a lot compared to other brands. Paint does not feel waxed, but it does shine. Must make sure to rinse thoroughly and dry promptly or you will get streaks - especially of you have hard water like I do.